Download your copy of “Your Best Recipe” The Top 20 Recipes from the EB Your Best Recipe Contest today! 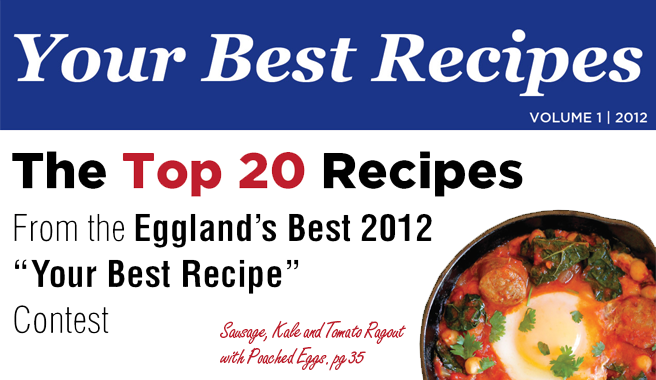 This eCookbook is FREE for EB fans, courtesy of Eggland’s Best. This eCookbook is a collection of the top 20 semi-finalist and winning recipes from our first ever “Your Best Recipe” Contest. “Your Best Recipe” celebrates the very best EB recipes from kitchens across the country, and is filled with simple, delicious recipes. From Breakfast to Dessert, these easy-to-make recipes will become instant favorites in your kitchen. You must login or register to download this content. Get the latest information, delicious recipes and advanced notice of new promotions delivered to your email. Join our conversation about all things Eggland’s Best including news, recipes, contests and more. An excellent source of vitamin B12, our eggs have 3 TIMES more than ordinary eggs.